Tools like Google Analytics and Kissmetrics can give you tremendous insights into where traffic comes from and what sources convert at the highest rates, but sometimes that's not enough. Especially in a world of inbound marketing, where the time between a visitor first being exposed to your brand all the way to finally signing up can be years, sometimes the best way to find out is to just ask. This guide will discuss how to ask customers how they found you. Answer: Word of Mouth; Follow-up: What did your colleague say exactly? 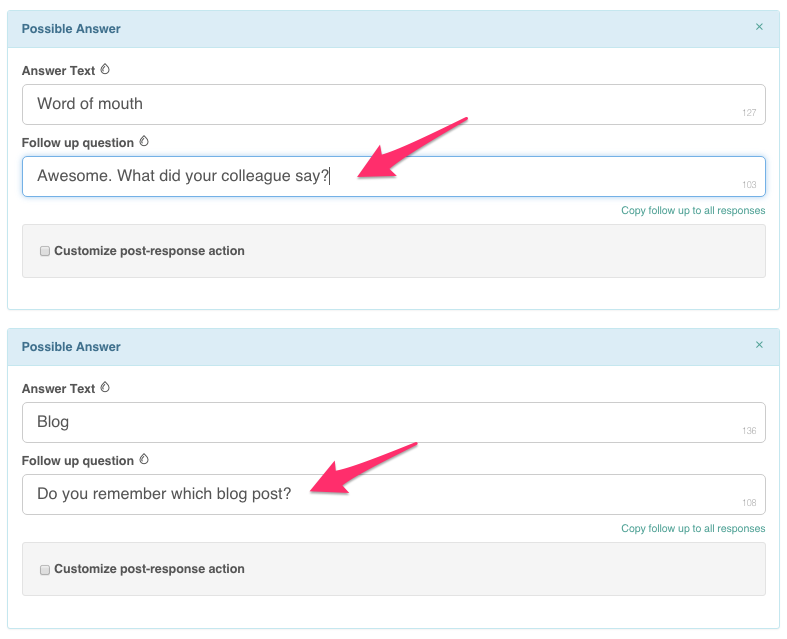 Answer: Blog; Follow-up: Do you remember which blog post? Answer: Advertisement; Follow-up: Where did you see the ad? Answer: Search Engine; Follow-up: What were you searching for? Answer: Other; Follow-up: What was it? You can then use Ramen's word cloud functionality on these results to see what people are saying. You can ask of this question of any customer, but you probably want to limit it to people that just signed up, as there's a good chance they'll forget. You'll want to track these answer over time to see if changes to your marketing focus is having the desired effect. From time to time, you may want to do high level retrospectives on these answers to see if people are finding you from surprising sources. Also, if you have a product used by multiple people--or even more importantly, an enterprise product where the buyer may be different from the user--you'll want to make sure to keep that in mind when segmenting the results.